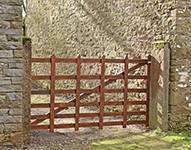 A standard gate is 5 bars but the Gayle Gate is a traditional local variation and has 6 bars to stop the lambs escaping. Again made to order and to your own measurements. Individually made and all unique, usually made from English ash for it’s beautiful grain and durability, this comfortable seat can be made to seat 1, 2 or 3 and is extremely comfortable. It is held together by traditional wooden pegs with no other fixings or glue - just skill. Can be ordered in other timbers and with matching table. Dedications can also be hand carved upon request. We call them Watchits and all are unique. We make them from special pieces of timber that we just have to use because they are so lovely and are just asking to be on show. No two are the same and they make an original and thoughtful gift. Each part of the country will have its own design and this is the traditional Yorkshire Dales version. Made out of ash which is lightweight and makes it easier to use, they are great nowadays for uses such as raking grass, cuttings and leaves up and we sell a lot to golf courses for raking the sand in the bunkers. For sale in our craft shop or come and help your children to make their own at our annual bird box making event during February Half Term which is also National Nest Box Week. 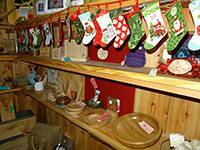 Come and join in our Christmas Craft Fayre which is the last Saturday in November. As well as our wooden crafts we have beautiful textiles made by the Craft Group who meet in the Mill every Thursday and carry on the textile traditions in Gayle Mill. 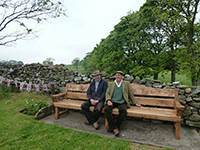 If you come to Hawes on your way to Gayle you can sit on this gorgeous bench and admire the view from Turfy Top, which is exactly why it was commissioned from us by Hawes Parish Council. 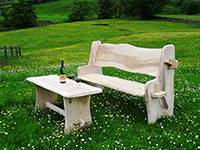 Made from oak, we are particularly proud of this bench to celebrate the Queen’s Diamond Jubilee which was in 2012. 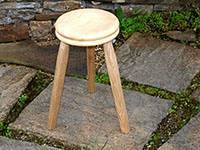 The ‘Gayle Mill’ king Stools - usually made from ash or oak and reproduces what historically was a vital tool for milking the local dairy cows to produce milk for the much loved local Wensleydale Cheese. You can even make your own on our Experience Day - see the workshops page for more details. 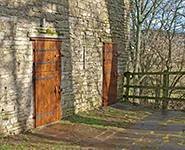 Bespoke stable doors made for the Quaker Meeting House at Bainbridge - made to order to a traditional design. A commission by The Three Horse Shoes pub at Wensley and made from English hardwoods. 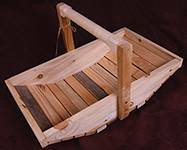 Made from larch for its durability and a well tried design - great for garden use but don’t stop there - this useful trug can be used inside and out for pretty much anything you can think of. Great for vegetables and flowers, as a gift hamper or just because you like it. 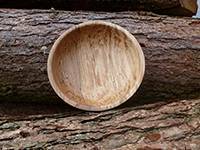 We usually have a selection of sizes and shapes of turned bowls in various timbers - this one is spalted beech with its beautiful and distinctive markings. This beautiful item captures the essence of Gayle Mill, from cotton spinning through to skilled woodworking over several hundred years of history. 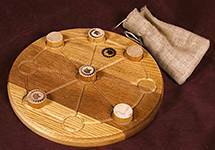 Made to order from English hardwoods - this one is spalted beech. 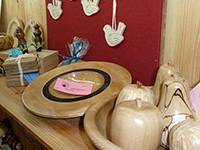 Hand made at t’Mill they make a great and useful gift and are usually made from beech or sycamore which are the best timbers for food use. 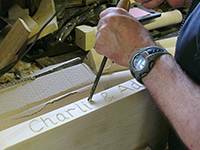 We are happy to carve a personalised message or date for that extra special gift. 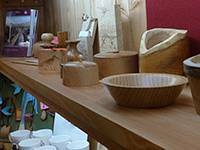 We always have a great and varying selection of craftsman made wood and turned gifts, all individual and made from English hardwoods - most can be made to order or we can also make bespoke one offs to your requirements. Merrills was a game played by the workers in Gayle Mill when first built in the late 1700s. It was so popular that boards were carved in the stone on the wall tops and are still there to see centuries later. Our boards capture that connection with the past. Made from English hardwoods to order. 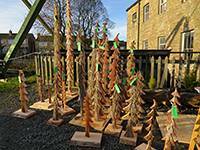 These are one of our most popular ranges and vary in size from tiny to 6ft tall. Made from larch so they can be used inside or outside and are durable. Great at Christmas or outside in the garden all year, but you may find it hard to stop at just one! 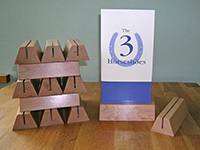 As with many of our products, the obelisk is a thing of beauty and usefulness. 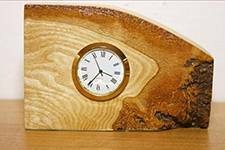 Made out of larch which we use for its natural high resin content meaning that it doesn’t need to be treated and ages to a beautiful silver grey. Can be made to any size.